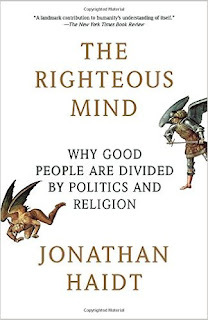 In The Righteous Mind, Haidt provides readers with a review of moral psychology research, which continues to be helpful in analyzing the culture wars between religious and political groups. I was introduced to the work by an exceptional undergraduate psychology major, Kayla Jordan, who is currently pursuing a doctorate in Social Psychology. Our published academic review is available online. In this review, I provide a summary and some thoughts about the usefulness of Haidt's approach. Haidt's work is organized around three principles of morality. First, “intuitions come first, strategic reasoning second,” Drawing on the philosophy of Hume and supported by research, Haidt explains how so much of morality is governed by emotion driven, automatic thinking, rather than cool, rational thought. This is a contrast to the common emphasis on moral thinking driven by beliefs that morality is based on considerations of justice (e.g., Fawls) or the weighing of consequences (e.g., Bentham, Mill). Haidt's second moral principle is, “There is more to morality than harm and fairness.” In this section, Haidt introduces us to six moral foundations people rely on when providing moral justifications. His research indicates liberals tend to emphasize two concerns about harm and fairness and sometimes liberty. However, conservatives tend to have a broader base that includes an additional three moral foundations: authority, loyalty, and purity. It is this second principle along with the six foundations that I found so useful when studying the different Christian cultures that are divided over matters of gender and sexuality (See A House Divided). In my view, the six foundations are not just emphasized by conservative and liberal Christians but these different tribes may emphasize different aspects of the same foundation. The third principle is that, “Morality binds and blinds.” Haidt suggests that people can switch from their typical individual survival mode to becoming groupish when activated by politics or religion. This group loyalty appears to be evident in American politics where there is a sharp divide between conservatives and liberals. And further, the divide is seen between conservative and progressive Christians. Haidt recognizes that he has provided a descriptive approach to morality. A prescriptive approach is needed to make moral decisions and here he leans toward consequentialism. Research is ongoing and should shed more light on how well the foundations help organize the justifications people provide for right and wrong. The hope is that as people become better at recognizing different moral perspectives they may engage in more productive dialogue than the present state of talking past each other.